We don’t all share the same sense of humor or the same views on life. Some people are huge jerks who just don’t give a damn and other people think their jokes are funny when in reality, they are taking things too far. From stabby squirrels to rebel unicyclists, these people prove that sometimes people take things a little bit too far. Some of our favorite instigators deserve to be locked up and others probably had no idea that what they were doing was going to piss off complete strangers. If you’re a pumpkin spice fiend, prepare to lose your lunch when you see what one grocery store did with a piece of salmon. Well, that’s one way to show up the kids from Breakfast Club by making actual breakfast! 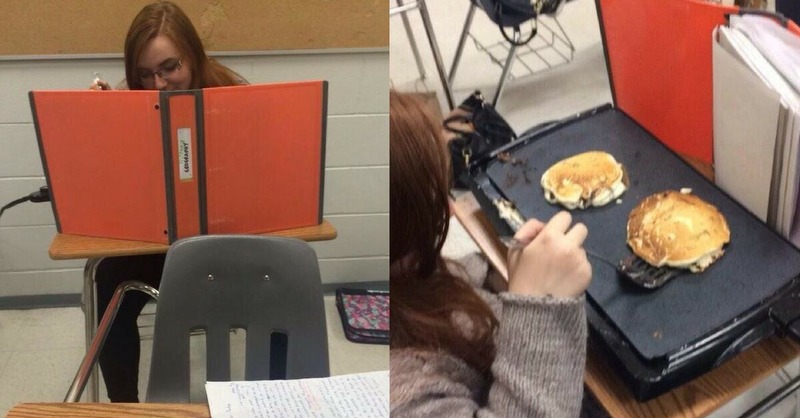 This is a great way to fool your teacher into making them believe you’re studying when in reality you’re trying to get that balanced breakfast out of the way. Hopefully, she brought maple syrup and butter for it!